Background: Bronchial wash cytology of lung lesions is a non/minimally invasive procedure utilized for diagnosis of pulmonary lesions. Aim: The aim of this study was to evaluate the efficacy of bronchial wash cytology in the diagnosis of bronchopulmonary lesions and assess the role of morphometry in categorizing dysplastic/malignant lesions. Materials and Methods: All cases of bronchial wash cytology received from January 2006 to June 2010 were retrieved and reviewed. Cases with adequate clinical data or a subsequent biopsy were selected for the study and cytodiagnosis was correlated with available clinical details. Morphometry was done on alcohol fixed hematoxylin and eosin stained cytosmears using computer assisted Image Pro software. Results: One hundred and seventy-six cases of the 373 cases of bronchial cytology received were included for the study. 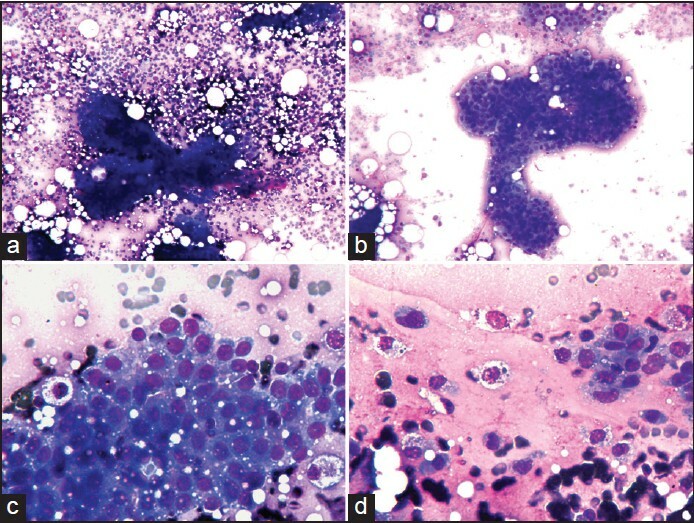 Bronchial wash cytology technique showed high specificity. Cytohistopathology correlation showed 62.06% concordance rate. Cells from normal epithelium, reactive atypia, neoplastic atypia, squamous metaplasia, non-small cell and small cell carcinoma showed a mean nuclear diameter of 7.4 μm, 11.7 μm, 13.9 μm, 13.0 μm, 10.7 μm, and 17.7 μm, respectively, which was statistically significant with P < 0.05. Multiple comparisons between various groups using analysis of variance and Bonferroni tests also showed remarkable statistical significance. Conclusions: Bronchial wash cytology has low sensitivity in detecting pulmonary lesions. It can be of value in patients with contraindication for biopsy. Morphometry can be a useful adjunct to cytomorphology, especially in situations where biopsy is contraindicated. Background: Cysticercosis, a parasitic tissue infection caused by the larva of Taenia solium, is quite a common disease in our part of the world, but its incidence is often underestimated. 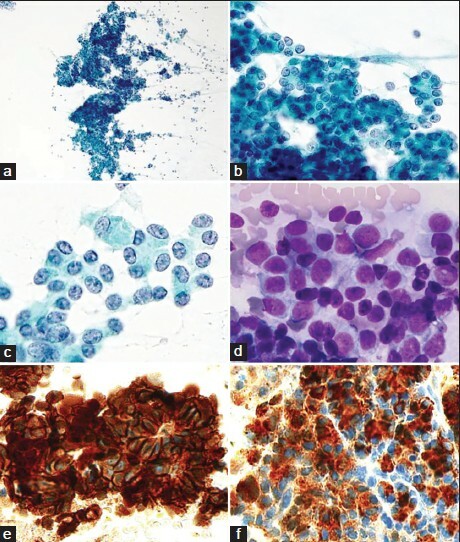 Fine-needle aspiration cytology (FNAC) plays an important role in early detection of this disease, especially when the lesion is located in anatomically approachable superficial locations. Aims: The aim was to study role of FNAC in the diagnosis of cysticercosis. Materials and Methods: In this retrospective study, the data of 137 patients with palpable nodules, who were diagnosed as having or suspicious of cysticercosis on FNAC, were retrieved and analyzed. 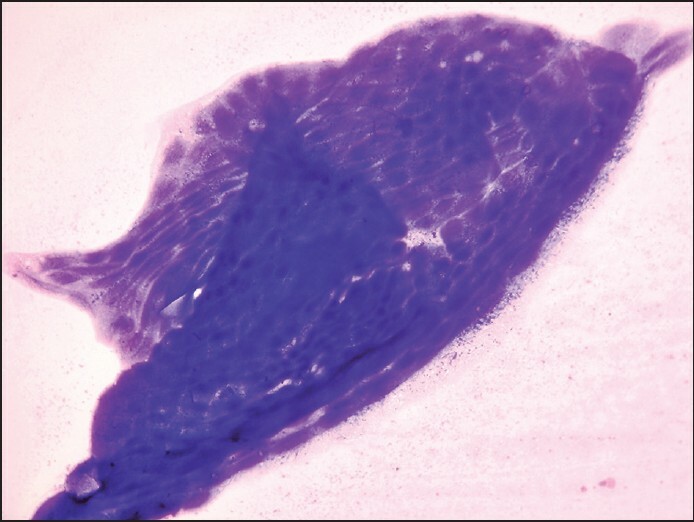 Results: In 129 (94.2%) cases, a definitive diagnosis of cysticercosis was obtained in the form of parts of parasite tegument, hooklets, parenchymatous portion and calcareous corpuscles. In the background, giant cells, mixed inflammatory cells, and epithelioid cells were present. 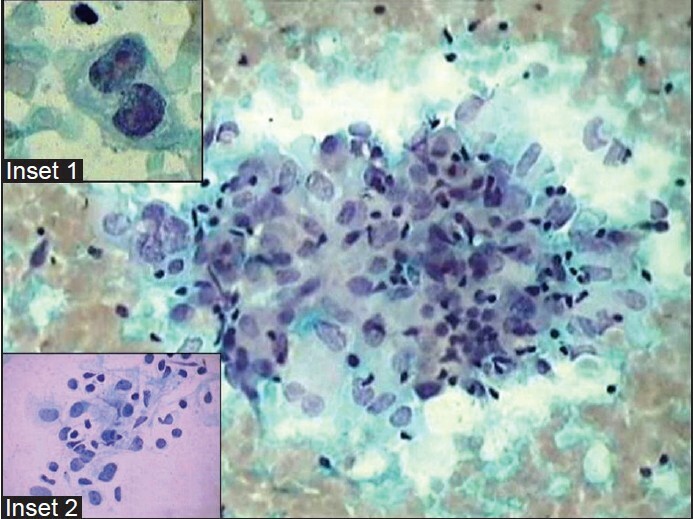 In remaining 8 (5.8%) cases, larval fragments could not be identified on the aspirates, and the diagnosis of parasitic inflammation was suggested on the basis of other cytological findings such as clear fluid aspirate, presence of eosinophils, histiocytes, foreign body giant cells, a typical granular dirty background, etc. 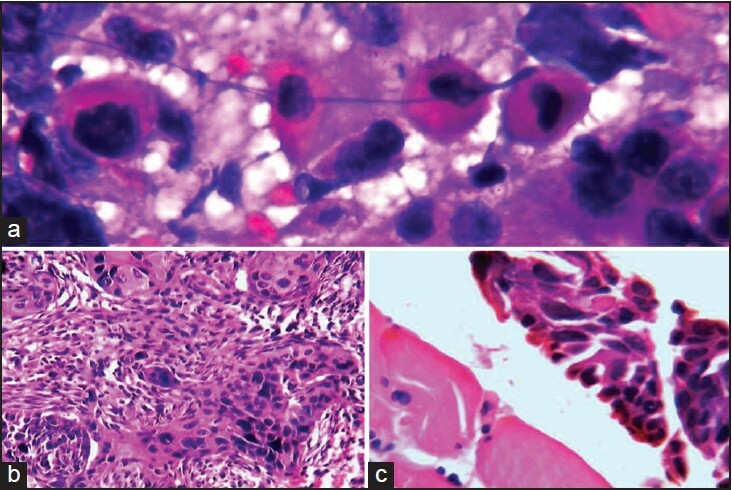 Follow-up biopsy in these 8 cases confirmed the diagnosis of cysticercosis in 7 (87.5%) while in 1 (12.5%) case, histopathology was suggestive of parasitic cyst. Conclusion: Fine-needle aspiration cytology in cysticercosis is a low-cost outpatient procedure. The cytological diagnosis is quite straightforward in cases where the actual parasite structures are identified in the smears. 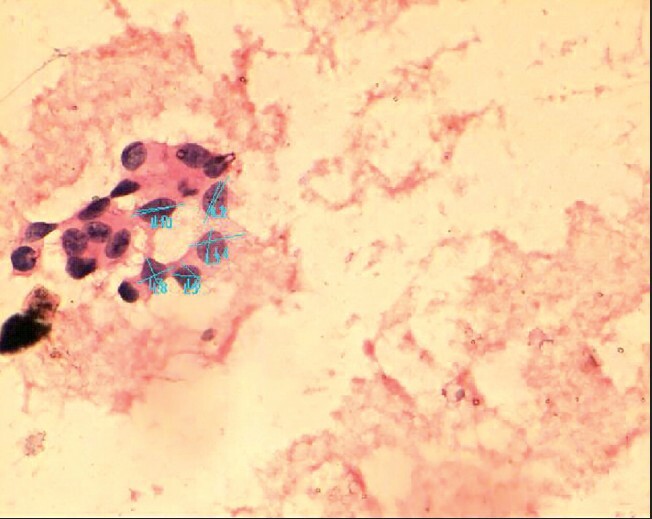 In other cases, a cytological diagnosis of suspicious of cysticercosis can be given if the cytological findings suggest the same. Background: Fine-needle aspiration cytology (FNAC) in the diagnosis of thyroid nodules is an easy and cost-effective method. The increase in malignancy rates of the excised nodules due to the high sensitivity and specificity rates of the FNAC is remarkable. Aim: The aim of this study was to assess the effectiveness of FNAC in the evaluation of thyroid nodules by comparing the results with histopathologic evaluation and comparing the consistency of the results with the literature. 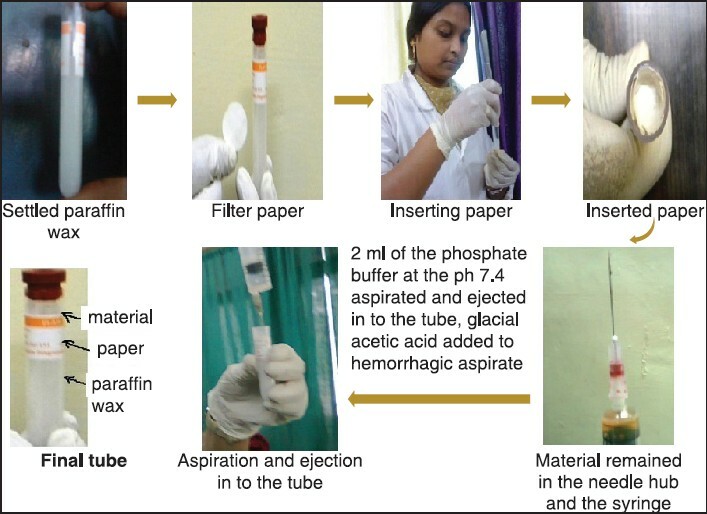 Materials and Methods: In this study, 1607 FNACs of 1333 patients which were classified according to the Bethesda system and 126 histopathological evaluations obtained from this group were evaluated. The mean age of the patients was 51.24 (range: 17-89, 17% male and 83% female). The sensitivity, specificity, positive and negative predictive values, and accuracy rates were evaluated. Results: The sensitivity was 87.1% and specificity was 64.6%. The positive and negative predictive value and accuracy rates were 76.1%, 79.5%, and 77.3%, respectively. Conclusions: In our study, the evaluation of thyroid FNAC samples with Bethesda system highly correlated with the results of histopathological diagnosis. However, combination of additional and advanced diagnostic methods such as immunocytochemical studies and molecular pathology techniques enhance the prognostic value of FNAC in patients with atypia of undetermined significance or follicular lesion of undetermined significance, lesions suspicious for malignancy, and suspected follicular neoplasm. Background: Paraganglioma is a rare tumor arising from clusters of neuroendocrine cells in association with sympathetic and parasympathetic nervous system. It poses a diagnostic challenge because of its widespread anatomic distribution, subtle clinical manifestations, and a variety of morphologic patterns. Aim: The aim of this study is to have an insight into the diverse morphologic spectrum of extra-adrenal paraganglioma (EAP). Materials and Methods: A retrospective analysis of seven cytologically diagnosed cases of EAP over a period of 10 years was performed. There were five superficial swellings and two deep seated retroperitoneal masses. The superficial swellings were aspirated directly, and the retroperitoneal masses were aspirated under ultrasound guidance using 22-gauge lumbar puncture needle fitted to a 10 mL syringe. Smears were reviewed for cellularity, pattern, cell shape, cytoplasm, nuclear features, and background. Results: The age of patients ranged from 25 to 75 years; four patients were males and three were females. Sites involved were carotid body region (four cases), para-pharyngeal space (one case) and para-aortic region (two cases). All the cases yielded hemorrhagic material on fine-needle aspiration. Smears showed scattered and clusters of cells and loosely cohesive acini of tumor cells. 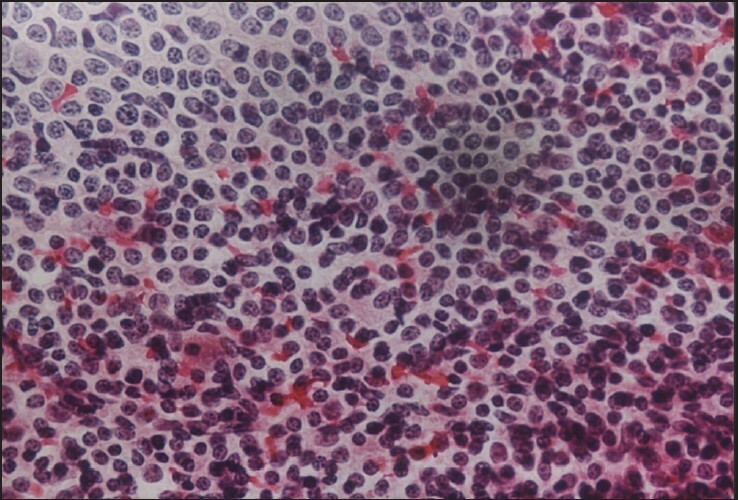 Cells were round to polygonal with pleomorphic nuclei, granular chromatin, inconspicuous nucleoli, and moderate to abundant cytoplasm containing fine pink granules and vacuolations. The cases were confirmed on radiology and histopathology. Conclusion: The cytologic features in EAP along with pertinent clinicoradiologic findings help in making an accurate preoperative diagnosis of an otherwise rare tumor. Background: Complexity in the anatomy of orbit and the fear of globe rupture are the main challenges faced in the diagnosis and typing of orbital masses. Fine needle aspiration cytology can be used as an initial investigative procedure in the evaluation of orbital masses, which in turn can aid the clinician to plan the treatment modalities. A close cooperation between ophthalmologist and pathologist adds to the success of the procedure. 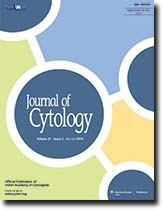 Aim: The study was conducted in an attempt to evaluate the role of fine needle aspiration cytology (FNAC) in the diagnosis of orbital lesions as a cost-effective diagnostic technique, and to assess its diagnostic efficacy by comparing it with histopathological diagnosis. Materials and Methods: The study was conducted on 50 patients, over a period of 3 years, who had presented with anterior orbital mass lesions with or without proptosis, and with those having accessible mass lesions. Patients with proptosis without anterior orbital masses, proptosis due to dysthyroid ophthalmopathy, arteriovenous fistulas, hamartomas and choristomas were excluded from the study. FNAC procedure was done after explaining about the procedure to the patient, and in the presence of an ophthalmologist. Results: Majority of patients belonged to the age group 50-59 years. Male: female ratio was 1.05: 1. The most common lesion on FNAC was non-Hodgkins lymphoma, [13 cases (31.7%)]. 11 (26.8%) cases out of this were confirmed to be non-Hodgkins lymphoma on histopathologic examination. Two cases turned out to be inflammatory pseudotumor. Conclusions: FNAC can be done in all palpable orbital mass lesions with minimal risk and complications, with close cooperation between ophthalmologist and pathologist. A good degree of correlation was obtained between FNAC and histopathology, which was assessed by kappa statistics. Acinar cell carcinomas (ACCs) of the pancreas are a rare tumor accounting for only about 2% of all pancreas tumors. 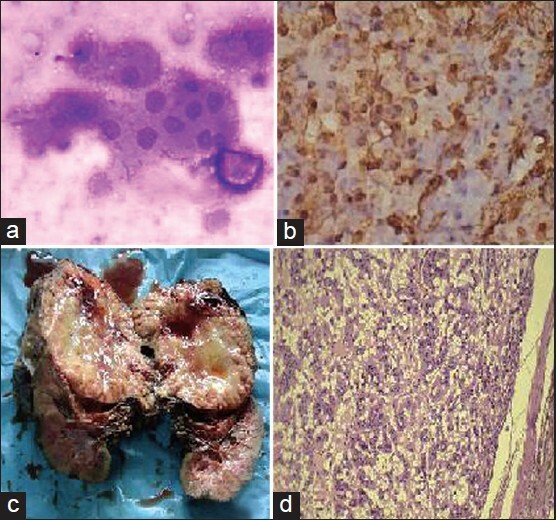 We report herein on this case and discuss how to distinguish ACCs from neuroendocrine tumors (NETs) and solid pseudo-papillary tumor (SPTs) morphologically and immunohistochemically. 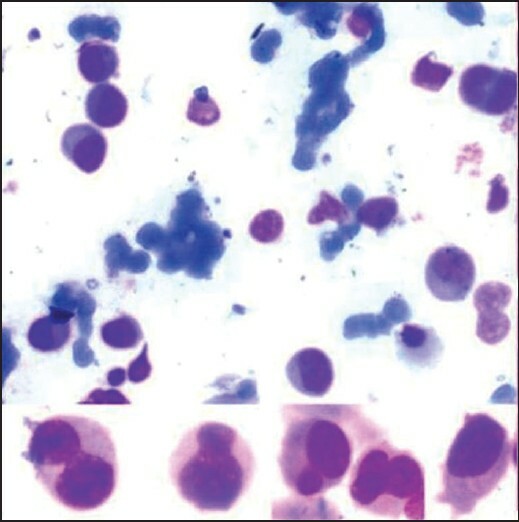 In cytological findings, the nuclear-cytoplasmic ratio was high, and the cytoplasm was granular, but zymogen granules were not evident. The nucleus was biased in location, assuming small circular and irregular forms. Chromatin was fine granular in shape and distributed nonuniformly, accompanied by evident nucleoli. Immunohistochemically was positive for β-catenin (cell membrane and part of nuclei), synaptophysin (focal), chromogranin A (focal) and chymotrypsin were all positive. Although the cytological distinction of ACCs from NETs and SPTs is difficult, the nuclear chromatin pattern and nuclear inclusion bodies, pseudopapillary arrangement and hyaline globules seem to play an important role in the cytological differential diagnosis. Furthermore, not only enzymatic and neuroendocrine markers, but also antibodies to β-catenin, vimentin and so on seem to be useful in the differential diagnosis. Invasive apocrine carcinomas of the breast are rare. 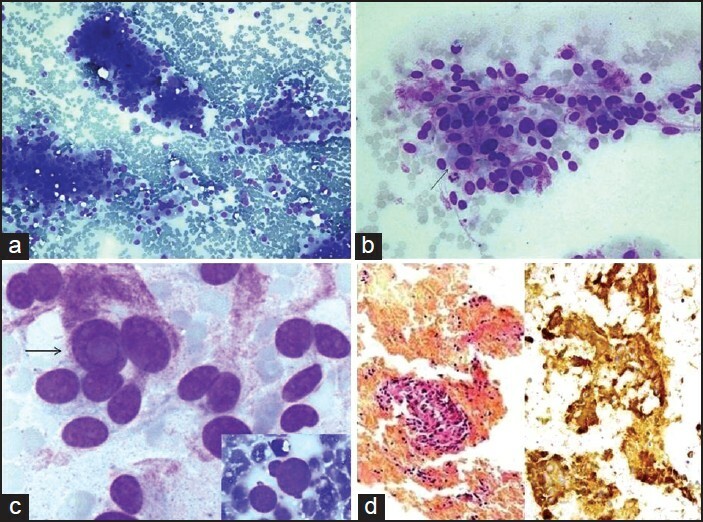 Fine needle aspiration cytology (FNAC) has been increasingly used as a primary screening tool for breast lumps, with high level of sensitivity and specificity. Preoperatively, apocrine carcinoma needs to be distinguished from benign apocrine lesions and other eosinophilic and granular cell tumors. We report a rare case of invasive apocrine carcinoma in a 70-year-old female presenting with a breast lump and no axillary lymphadenopathy. FNAC was advised which yielded moderately cellular smears composed of loosely cohesive clusters of large, polygonal cells with centrally located pleomorphic, vesicular nucleus with prominent nucleoli and abundant, basophilic and granular cytoplasm. Based on above cytomorphological findings, diagnosis of apocrine carcinoma was offered. The patient then underwent right modified radical mastectomy with axillary clearance. Based on histomorphology and panel of immunohistochemical (IHC) markers the diagnosis was confirmed. 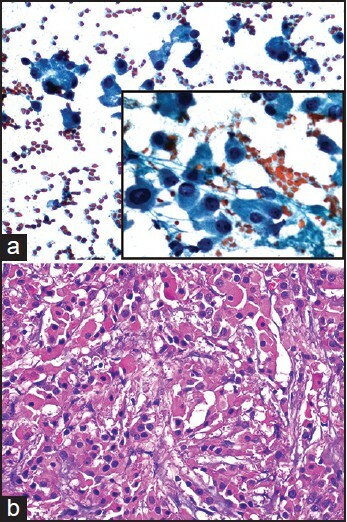 Although apocrine/oncocytic cytomorphology is seen in few types of breast neoplasms, high index of suspicion and subsequent IHC study clinches the diagnosis. Collagenous spherulosis is a rare entity usually seen in association with benign breast lesions. It is often picked up incidentally with a reported incidence of about 0.2% in cytological material. There are very few reports describing cytomorphological features of collagenous spherulosis. To the best of our knowledge this is the only case reported from the middle-east region. 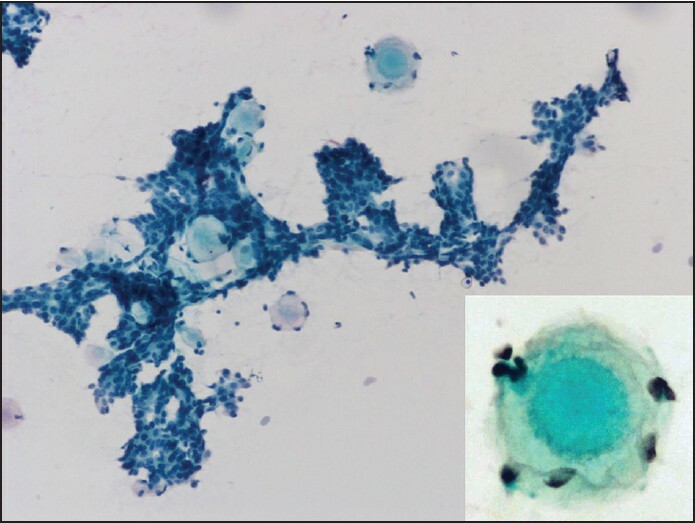 The presence of hyaline spherules surrounded by a single layer of benign myoepithelial cells is the hallmark of collagenous spherulosis on FNA. However, due to close cytological resemblance, it can be misdiagnosed as adenoid cystic carcinoma of the breast. A 40-year-old woman presented with a history of a painless lump in the infraareolar region of left breast for a year. Fine needle aspiration was performed. The smears showed scanty cellularity comprising of cohesive clusters and a few branching fragments of benign ductal epithelial cells closely intermingled with many spherical, acellular homogenous hyaline globules. Few bare bipolar nuclei were noted in the background. A diagnosis of collagenous spherulosis associated with benign proliferative breast disease was made. Cytopathologists need to be aware of this entity in order to differentiate it from adenoid cystic carcinoma of the breast which requires radical treatment. Primary neuroendocrine (NE) carcinoma of the male breast is very rare. NE breast cancers encompass a heterogeneous group of tumors exhibiting morphological features similar to those of NE tumors of the gut and lung. They express one or more NE markers in at least 50% of the tumor cells. They are rare lesions representing about 2-3% of all breast cancers and more frequently affecting elderly patients. The present case report deals with a NE breast carcinoma in an 80-year-old male who presented with a right breast mass and axillary lymphadenopathy. The cytological features were suggestive of NE carcinoma. A thorough clinical evaluation helped confirm the primary nature of the tumor. The histopathology and immunohistochemistry helped confirm the cytological diagnosis. 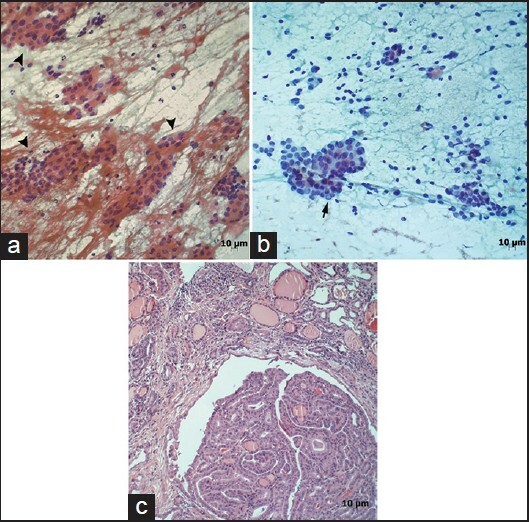 The histogenesis and prognostic implications of this rare breast tumor with predominant NE differentiation, unusually occurring in a male, is discussed here. Intrathyroidal metastasis and direct extension of extrathyroidal malignancies can present with palpable thyroid nodules or may be detected as suspicious nodules in a thyroid scan. They can lead to diagnostic difficulty in fine needle aspiration cytology (FNAC) of the thyroid, especially in the absence of any previous history of such malignancies. Here we report an interesting case of intrathyroidal metastasis, which was initially suspected as a primary carcinoma of the thyroid; along with a short summary of a series of 11 cases of carcinomas of extrathyroidal origin, diagnosed in the FNACs of thyroid over the past three years in our institute. Knowledge of the potential diagnostic pitfalls in thyroid FNAC, a proper clinical evaluation, and judicious use of the ancillary techniques will help to attain a proper diagnosis. Adrenocortical carcinoma (ACC) is a rare malignancy and cytodiagnosis of this tumor is not routinely encountered by a cytopathologist. 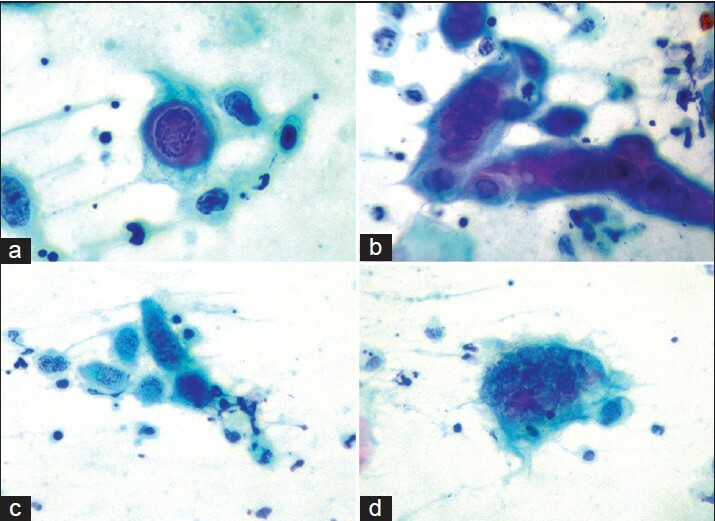 Here, we report a case of ACC initially diagnosed by computed tomography (CT)-guided fine needle aspiration cytology (FNAC) with the help of immunocytochemistry. A 48-year-old lady presented with flank pain and abdominal mass for the last 6 months. A CT scan of her abdomen revealed a large mass arising from the upper part of the left kidney. CT-guided FNAC was performed. Cytologic smears showed pleomorphic large cells arranged discretely and in small aggregates against a myxoid background. The cells had a high nucleocytoplasmic ratio, anisonucleosis and conspicuous nucleoli. Based on cytomorphology, differential diagnoses of ACC and renal cell carcinoma (RCC) were made. On immunocytochemistry, the tumor cells were synaptophysin, inhibin, vimentin and Melan-A positive but cytokeratin and epithelial membrane antigen negative. Thus, a cytodiagnosis of myxoid ACC was made and histopathologic examination was suggested. Subsequent histologic examination and immunohistochemistry proved the case to be myxoid ACC. Multiple myeloma is a disease resulting from clonal proliferation of plasma cells. A disease of the elderly, jaw lesions are seen in 14% of patients affected with myeloma. Rarely the oral and maxillofacial lesions can be the first manifestation of the disease. We report the case of a 75-year-old man who presented with mandibular swelling. 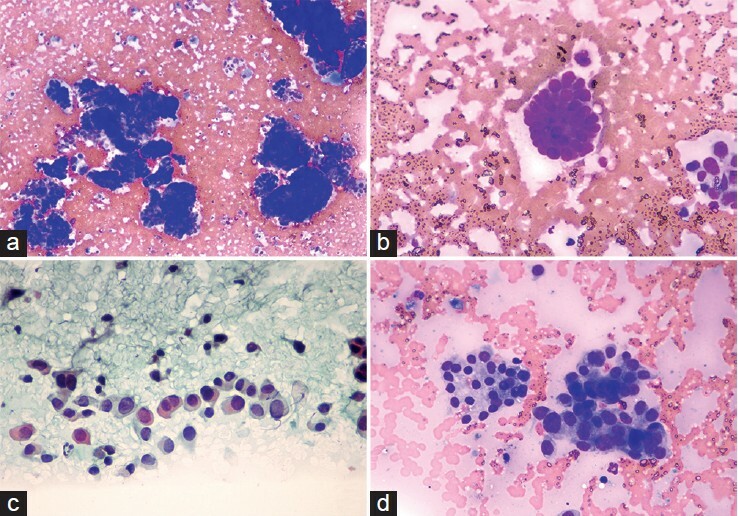 Fine-needle aspiration cytology was done from the swelling and smears were suggestive of anaplastic myeloma, which is a rare and aggressive variant of myeloma. The diagnosis of a plasmacytoma was confirmed by biopsy. Further workup of the patient revealed osteolytic lesions in skull, M band in electrophoresis and evidence of renal failure. Peripheral smear and bone marrow findings were also consistent with myeloma. Carcinoma of lung can metastasize to any organ system; however, metastasis to skeletal muscles is extremely rare. A 63-year-old man, known case of pulmonary tuberculosis on treatment, presented with a painful swelling in his left leg. Examination revealed a 5.0 cm × 3.0 cm calf swelling, which on imaging was suggestive of a soft tissue tumor. 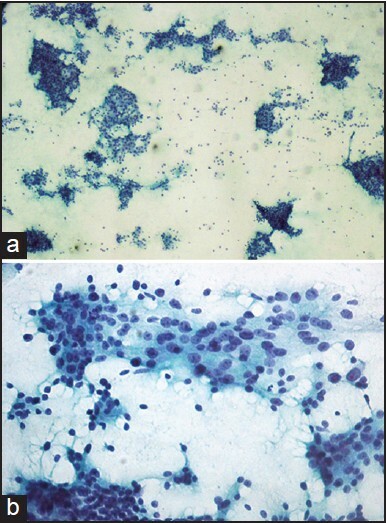 Fine-needle aspiration cytology of the swelling revealed it to be squamous cell carcinoma. Further investigations revealed a mass in the left lower lobe of the lung. Biopsies from both the lung lesion and calf swelling confirmed the diagnosis of squamous cell carcinoma of lung with metastasis to the calf muscle. The case is being presented because of its unusual presentation and rarity. Papillary lesions of the breast pose diagnostic challenges on aspiration cytology due to overlapping features of benign and malignant entities. Accurate cytologic diagnosis of papillary breast carcinoma cannot usually be made pre-operatively. We present the case of an adult female who underwent fine-needle aspiration (FNA) of a left breast lump. FNA smears were highly cellular showing cohesive clusters, complex papillary fragments and few singly dispersed intact cells. The tumor cells had hyperchromatic nuclei, prominent nucleoli and mild nuclear pleomorphism. A cytologic impression of papillary lesion, possibly malignant (in view of high cellularity, complex papillae and single intact cells) was rendered. The lesion proved to be a papillary carcinoma with microscopic foci of stromal invasion on histologic examination. Papillary carcinoma, an uncommon subtype of breast carcinoma, should be considered while evaluating a papillary lesion with complex branching papillae containing delicate fibrovascular cores and singly lying intact atypical cells.